20 Jun What’s in a name? Visualizing the contents of your meeting is still a relatively recent phenomenon, known by multiple names. Brace yourself for a non-exhaustive battery of synonyms: cartooning, conference visuals, flip charting, information artist, live-meeting notes, onsite visuals, visual facilitation … We could go on. 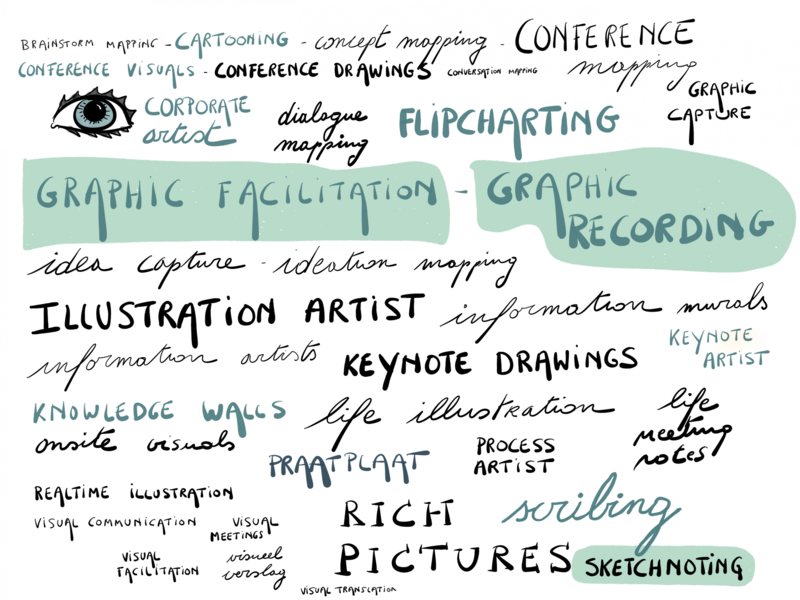 In our opinion these three terms cover it best: graphic recording, graphic facilitation and sketch noting. If you’re looking for someone who knows how to ‘draw’, then please stop to consider whether the kind of format and the people you’re thinking of hiring are your best options to achieve your specific goals. Are you looking for an illustration to go with your text, or a rather for a cartoon to make people laugh or to get them thinking? Or… is it a visual summary of your meeting’s content you’re after? Where does the company name Visual Harvesting originate from? Designing a concept is one thing but coming up with a company name, that’s a different story. When I started my business back in 2009, I chose… Visual Harvesting, which roughly means… harvesting visually. It reflects what we do. We don’t do casual sketches and we don’t do cartoons. We get busy with strategic management content. We help you facilitate your process by drawing that content live on a large graphic wall. And that’s not where your (our) story ends. After the meeting if ever you need any advice on how to successfully promote your images, we’ll still be here to guide you.